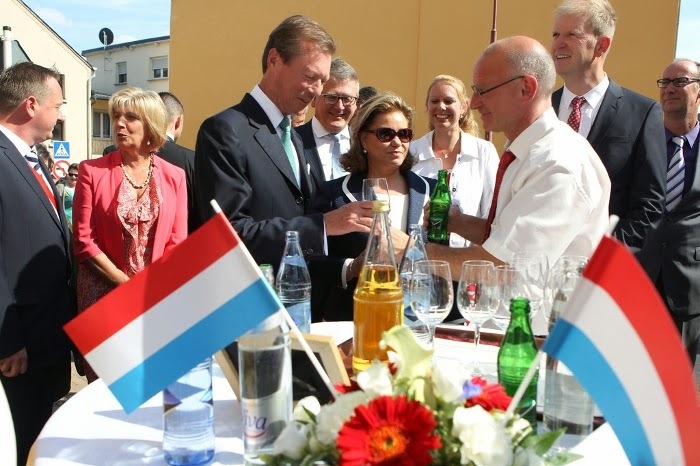 On the occasion of National Day, Grand Duke Henri and Grand Duchess Maria Teresa visited Rosport, a commune and small town on the banks of the Sauer river in eastern Luxembourg, today. Located in the canton of Echternach, the town of Rosport roughly has 650 citizens. The commune also includes the villages of Dickweiler, Girst, Girsterklaus, Hinkel, Osweiler and Steinheim. All in all the commune has about 2000 inhabitants so it's not hard to imagine what a big thing the visit by the Grand Duke and Grand Duchess was. Upon their arrival to Rosport, the royal guests were welcomed by mayor Romain Osweiler as well as Ministers Nicolas Schmit and Carole Dieschbourg. After being introduced to other local authorities, the Grand Duke and Grand Duchess got the chance to discover the Sauerpark, a large children's playground. Together with children from the neighbouring German commune of Ralingen located directly on the opposite side of the Sauer river, children from Rosport gave a performance for Grand Duke Henri and Grand Duchess Maria-Teresa. Afterwards, the Grand Ducal Couple was given a presentation about trans-border cooperation between municipalities. After touring the village by foot and a stop at the town's oldest pub, the Café du Commerce, the Grand Duke and Grand Duchess paid a visit to the Rousperter Kleederstiffchen, an association of volunteers helping families who find themselves in difficult situations. The Grand Ducal Couple's visit continued with the laying of a wreath of flowers at the Second World War memorial next to the parish church and a visit to the local castle formerly owned by Luxembourgish industrialist and inventor Henri Tudor, who developed the first practical lead-acid battery in 1886. Today the castle built in 1892 and usually either called Château de Rosport or Château Tudor houses a museum as well as the municipal administration. After a tour of the surrounding park, Grand Duke Henri and Grand Duchess Maria-Teresa got the chance to mingle with locals to round off the visit. A video of the Grand Ducal Couple's visit can be found at RTL. Galleries of visuals are offered by Wort in German, Wort in French and Wort in English. Prince Max Officially Visits U.S. Welcome to the Royal Business! Félix and Claire Expecting a Girl?